You are currently browsing the tag archive for the ‘sawmill’ tag. Mickey and Donald (in his third appearance) are policemen hunting Pete who has ‘dognapped’ Minnie’s dog Fifi. The chase, which includes a lot of gunfight, ends in a sawmill where all three have to cope with a runaway circular saw. The cartoon is outstanding for its fast pace and high content of gags. Mickey and Donald are staged as a duo, but, like in ‘Orphan’s Benefit’, Donald Duck is given the last shot. 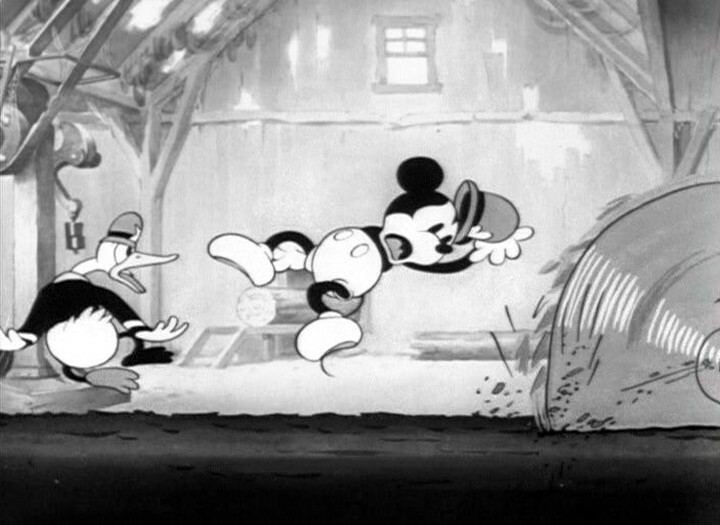 ‘The Dognapper’ would remain Mickey’s and Donald’s only genuine duo cartoon, but it set the stage for the famous trio outings of the late thirties in which Mickey, Donald and Goofy would fight the odds together. Goofy, the only missing element, would join Mickey and Donald a few months later, in ‘Mickey’s Service Station’ (1935).